Bill Baer writes for Crashburn Alley, a Phillies sports blog that is part of ESPN.com’s network of baseball blogs. He is also a contributor to Baseball Prospectus and cohosts a local radio show. He lives in Aston, Pennsylvania. 100 Things Phillies Fans Should Know & Do Before They Die was featured with an author interview on Yahoo! Sports. 100 Things Phillies Fans Should Know & Do Before They Die was mentioned on NBC Philadelphia's Phillies blog on May 3rd. Bill Baer, author of 100 Things Phillies Fans Should Know & Do Before They Die (Triumph Books; 9781600786785), will be interviewed on Voice of Russia, the U.S.-based arm of the national radio network that broadcasts on 1430 AM in New York City and 1390 AM in Washington, DC, on April 30, 2012. Bill Baer, author of 100 Things Phillies Fans Should Know & Do Before They Die, interviews with WBCB-AM in Philadelpia. PhilliesNation TV gave away a copy of 100 Things Phillies Fans Should Know & Do Before They Die during their frist broadcast. Watch the episode on Youtube. 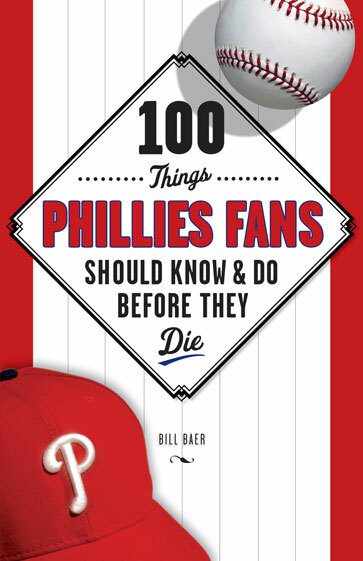 100 Things Phillies Fans Should Know & Do Before They Die author, Bill Baer talks Phillies with ESPN.com's Eric Karabell on "Baseball Today." Read an excerpt posted to ESPN.com. Bill Baer, author of 100 Things Phillies Fans Should Know & Do Before They Die, talks about Phillies memories on "Time's Yours" Podcast. Most Phillies fans have taken in a game or two at Connie Mack Stadium, Veterans Stadium, and now Citizens Bank Park. Many have seen highlights of a young Mike Schmidt, and have heard the story of the team’s improbable 2008 World Series victory. But only real fans know the infinite wisdom of Charlie Manuel, why trading Ryne Sandberg was one of the worst decisions in the team history and how to tailgate Philly-style. Whether you’re a die-hard booster from the days of Richie “Whitey” Ashburn or a recent supporter of Shane Victorino and the team of the City of Brotherly Love, these are the 100 things every fan needs to know and do in their lifetime. If you want to call yourself a true Phillies aficionado, increase your knowledge of the franchise, and experience the full extent of Philadelphia baseball, then 100 Things Phillies Fans Should Know & Do Before They Die is a must read. About the Author: Bill Baer writes for Crashburn Alley, a Phillies blog that is part of ESPN.com’s network of baseball blogs. He is also a contributor to Baseball Prospectus and co-hosts “Stathead,” a radio show on CBS Philadelphia. Baer lives in Aston, Pennsylvania.